Nova Scotia fishermen have been blocking a survey boat hired by Northern Pulp to design a route for an effluent pipe into the Northumberland Strait. Pictou County fishermen and the local Mi’kmaq community warn the pipe plan will threaten the Strait’s ecology, including key lobster fishing grounds. Currently, some 70 million litres of treated waste daily still flow daily into lagoons on the edge of the Pictou Landing First Nation reserve. The new effluent treatment facility would replace Northern Pulp’s current wastewater treatment plant in Boat Harbour, a facility that has processed the mill’s bleached kraft pulp effluent for some 50 years. But after a pipeline break, the facility was essentially ordered by the province in 2015 to shut its doors by 2020. The mill’s new plan is to build a treatment facility to handle some 75,000 cubic metres of wastewater daily, using an activated sludge treatment system that would aerate and settle the effluent into a large tank on the mill’s property. 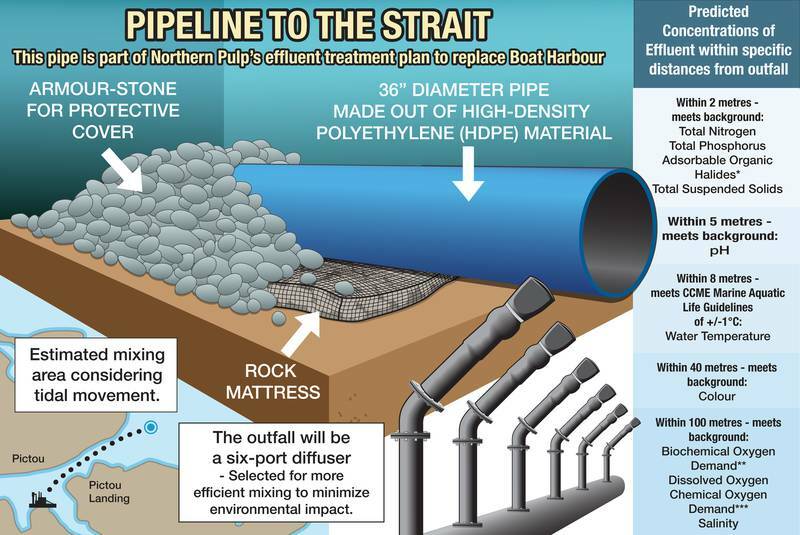 A pipe running along the floor of Pictou Harbour to the outflow area would use a diffuser system to release the effluent in smaller intervals, the company says. The fishermen’s blockade of the Northern Pulp survey vessel comes on the heels of an effluent leak at the paper mill last month due to a faulty pipe. While a number was not released by mill officials, the province’s environment officials stated the leak was a “fraction” of the leak the mill had in 2014, when 47 million litres of effluent flowed into a nearby wetland and into the East River Estuary. The mill was fined $225,000 by Environment and Climate Change Canada. Nova Scotia Premier Stephen McNeil told media last week that the company’s research on the water is lawful, but that it’s essentially up to the management at the Northern Pulp mill near Pictou to decide whether to call in the RCMP to end the blockade. Paper Excellence, parent company of the mill, has said the facility and its 300 employees will be out of work unless it can build the pipeline to the Strait. It has not offered any alternative measures, and does not believe the underwater pipe would endanger the area’s ecology. Pictou Mayor Jim Ryan said his concerns with the mill’s plan were compounded when officials learned that the mill’s Plan B would include an overland stretch of pipeline along the causeway across Pictou Harbour. It would also cross the town’s watershed and the Caribou wellfield, a source of domestic drinking water for the town and some people in the immediate area. During summer 2018, more than 1,000 people protested the mill’s plans by raising signs such as “No Pipe, No Way!” near the marina in Pictou. Prior to the summer protests, Ronnie Heighton, President of the Northumberland Fishermen’s Association, released a statement about the growing controversy over the mill’s plans. “First, we are working to get the environmental assessment of this project into the hands of the federal government. A federal environmental assessment would require a more detailed process with more time for public input than a provincial assessment,” wrote Heighton.